SKU: SM-RH75 Categories: Corporate Apparel, Ladies, Women's Corporate Apparel, Women's Corporate Shirts, Woven Shirts, Women's Clothing, Button Down Shirt, Ladies Business Casual Brands: Red House. 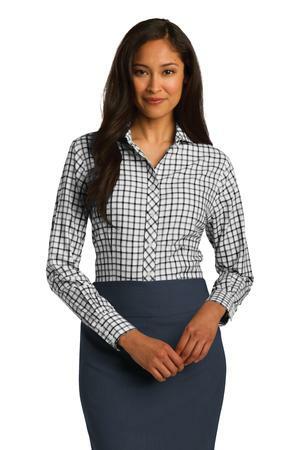 A beautiful check pattern elevates this shirt while an enhanced non-iron finish keeps it looking polished. Woven with 40-singles and 80-doubles yarn this two-ply 100% cotton style has bias-cut details inside collar stand and under cuffs. Gently contoured silhouette and front and back darts. Open collar with collar stays. Red House engraved buttons and embroidery on the right sleeve placket.